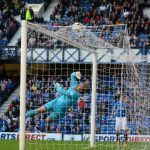 Raith Rovers were swept aside by Rangers for the second time this season, in a match where the Kirkcaldy side were undone by a raft of individual errors at the back. Manager Grant Murray retained the same system from last Friday’s 4-3 home defeat by Queen of the South, but made two changes to the starting XI, both of which were enforced. Barrie McKay’s ineligibility, meant a return to the side for Grant Anderson, while the injury Christian Nade picked up against the Doonhamers saw him miss out, meaning Mark Stewart was earmarked for the lone forward role. 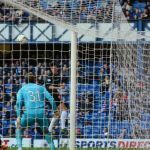 Both Stewart and Anderson made a positive impression after coming on with just over half-an-hour remaining in last weekend’s defeat, and Anderson was quick to make his mark at Ibrox, by crafting the first chance after three minutes. 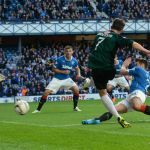 Turning away from Lee McCulloch, a huge space opened up in front of him, but Darren McGregor managed to block his shot at the last moment. With Kenny Miller back in the Rangers side after recovering from injury, he was alongside Kris Boyd, in a partnership that had so far flattered to deceive, during their limited outings together. 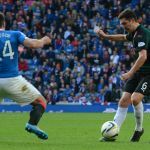 The early exchanges did suggest that they were rekindling some kind of understanding, and they combined to allow Miller a sight of goal after five minutes, but his attempt was weak, and easily saved by Laidlaw. The parity only lasted until the eighth minute however, when Raith conceded a goal in the softest of circumstances. 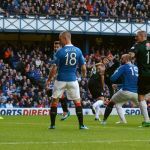 A Lewis Macleod corner was drifted up into the box, and McCulloch was completely unhindered as he nodded Rangers in front. 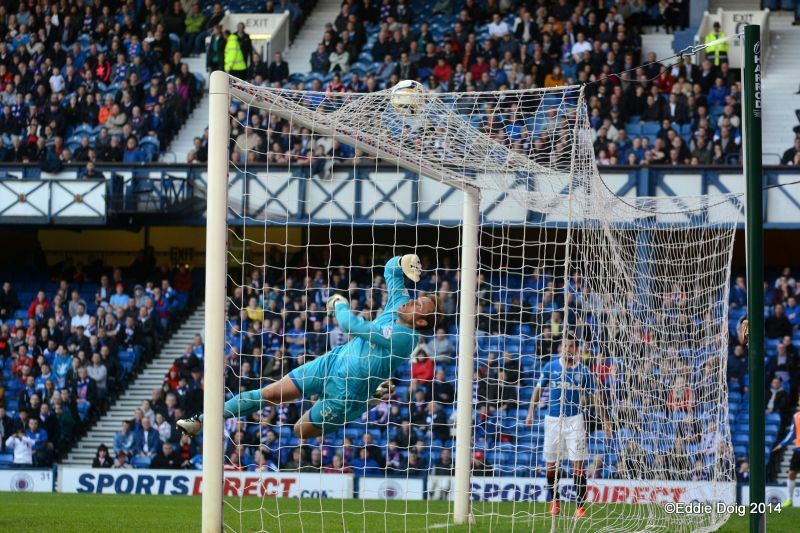 A few minutes later it was almost two, when Fraser Aird burst down the right hand side and into the box, but his finish was beyond both Ross Laidlaw, and his back post. Raith’s next opening came from a free-kick, after good work from Martin Scott, ended when he was upended by McCulloch. 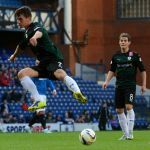 Considering how well Ryan Conroy has done from set-pieces this season, his attempt from 22-yards out, ended up disappointingly wayward. At this point, midway through the first half, Rovers looked tidy in possession and were seeing plenty of the ball, but with only Stewart up top, their passes were going side-to-side, rather than forward. 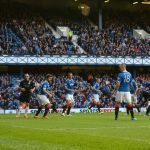 It allowed the players time on the ball and to build some confidence after the early setback however, and you sensed Grant Murray’s men were coming back into things. Martin Scott was the focal point of most of Raith’s good work, while Liam Fox was doing an efficient task of helping to protect the back four. Anderson was also proving a handful to Richard Foster, and he skipped past him and headed to the bye-line, but saw his attempted cut-back diverted past. 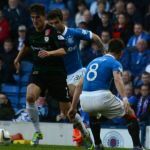 Rangers were on the back foot at this point, and Paul Watson should have tied the match up ten minutes before half-time. Conroy’s corner found the central defender in space in the penalty area, but unlike McCulloch at the other end, he planted his header wide. Then, with a wearying sense of inevitability, Raith were made to pay for that miss just two minutes later. The Rovers defence weren’t set up for a quick free-kick, which saw Boyd pass to Miller, who in turn played Nicky Law through on goal. 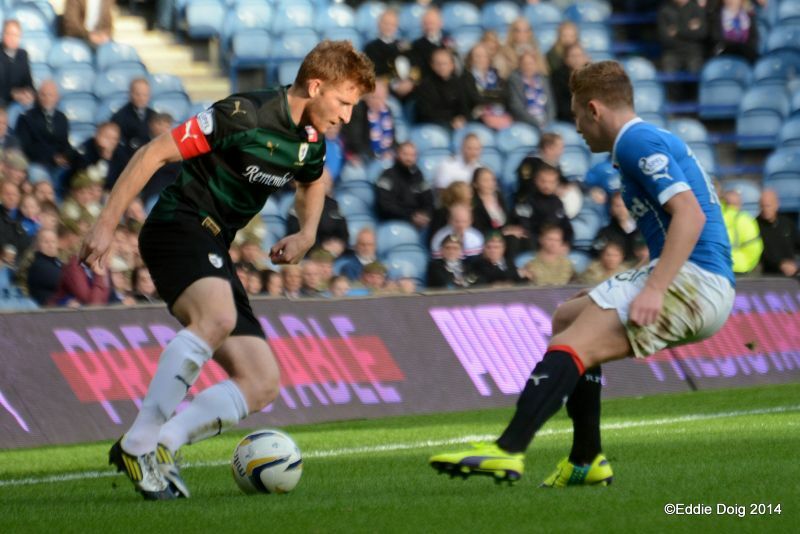 The midfielder confidently placed the ball past Laidlaw to make the score 2-0 at the interval. 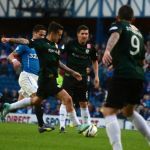 Despite being the better side, it had been a fairly lethargic opening by Rangers during the first period, and they started the second half in the same fashion, with Raith pushing forward. As in the first half, Anderson was the first to threaten, sidestepping Foster, before bursting into the box at an angle. As in the opening few moments however, his shot was crowded out. Coroy’s corner was then met by Thomson, who almost found the net with a back post header. Kevin Moon then had a great opportunity from the edge of the box, but he couldn’t get any purchase on his attempt. Raith kept going though, and got the goal that their play merited in the 53rd minute. Conroy’s deep cross was excellently kept alive by Anderson who headed it back to Scott, and he nodded past Simonsen from close range. What was required at that stage was for Raith to take stock, and build on the momentum that they’d generated since the start of the half. Instead, they lost it all, within seconds of the restart. A miscued clearance from Paul Watson in the penalty area, allowed Kris Boyd to tee up Miller, and he was able to find time to place his shot into the corner. 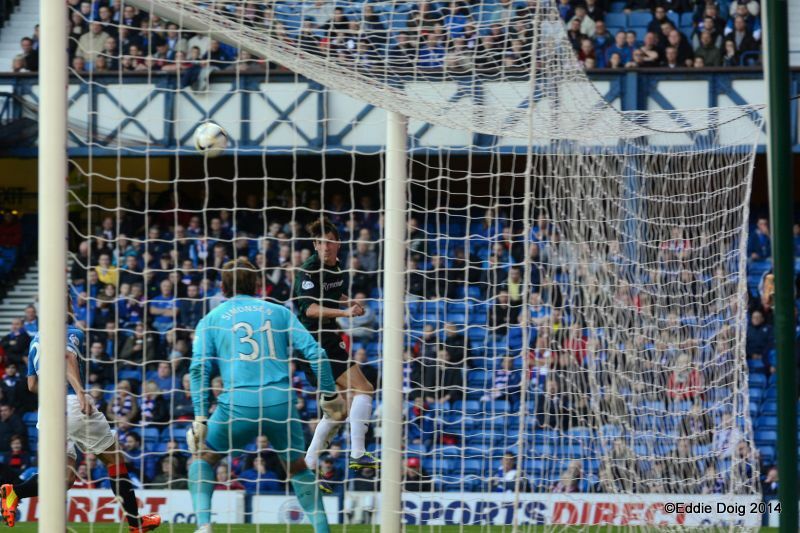 Rangers sensed that the game was theirs for the taking at that point, and with Rovers deflated, the worry was that Rangers would run away with it. 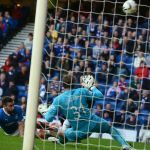 Twice in as many minutes, Ross Laidlaw denied Kenny Miller with two, excellent point-blank saves, but despite that, the goalkeeper will be disappointed with the fourth goal in the 60th minute. Kris Boyd was able to turn his man on the edge of the box, but his shot was poor, and close to Laidlaw. Despite getting his hands to it, the ball somehow ended up behind him and in the net, killing off any hopes of a fightback. 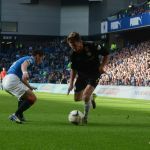 The finish was Boyd’s first league goal of the season, and he was replaced in the 70th minute by a striker who was also chasing his opening strike of the Championship campaign, Jon Daly. By the end of the match, the big Irishman would have two. His first came in the 83rd minute, when he finished from close range after a cross from Clark, while his second arrived in similar circumstances in the final minute, when he bundled home a Foster cross from the right. It may sound odd to suggest that a 6-1 shellacking could be compared to last weekend’s tight loss to Queen of the South, but ultimately the games had similar traits. In both, Raith managed to work themselves back into the game, before undoing all their good work by conceding soon after. Both matches have also saw good forward play, hamstrung by poor defending. Raith will need to continue the former, and cut out the latter, when they welcome Alloa Athletic to Stark’s Park next week. Welcome to Ibrox, it's slightly overcast, however there is a swirling wind round the park. Rangers kick off towards the Broomloan Stand. Anderson on a breakaway is foiled by McGregor just inside the area. Stewart operating as the front man. Thomson flattened, but gets back to his feet without treatment. Rangers first corner MacLeod into McCulloch whose header finds the back of the net. Goal Rangers. Law and Boyd combine outside the box, the latters shot is easily saved by Laidlaw. 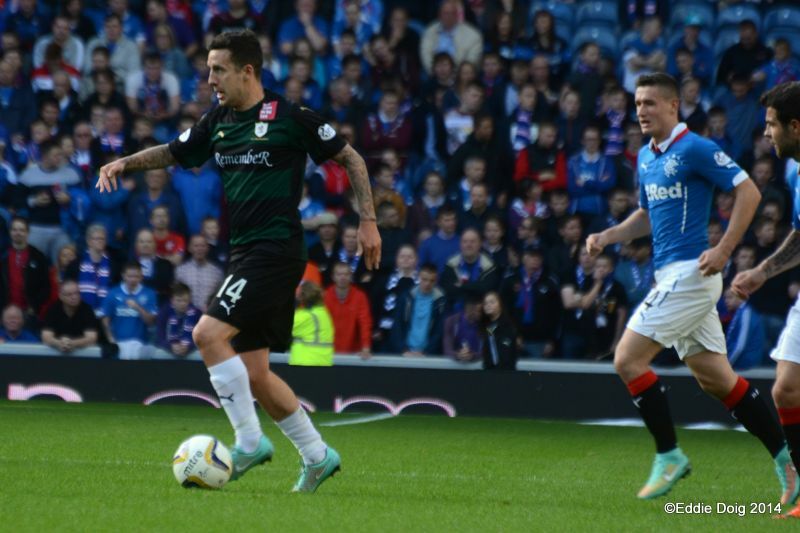 Aird charges down the right, into the box and fires the ball across goal. Conroy with a free kick from 20 yards sends the ball narrowly over Simondsen's bar. Lee Wallace tries a cheeky wee chip from 25 yards, his effort lands on the roof of the net. Raith make yardage on the right but the move fails when Scott's pass goes into the box with no takers. Conroy takes a free kick on the bye line, it is over hit and goes out of play. Anderson on the left cuts into the box and shoots, Simonsen parries for a corner. From the corner, Watson heads over the bar. 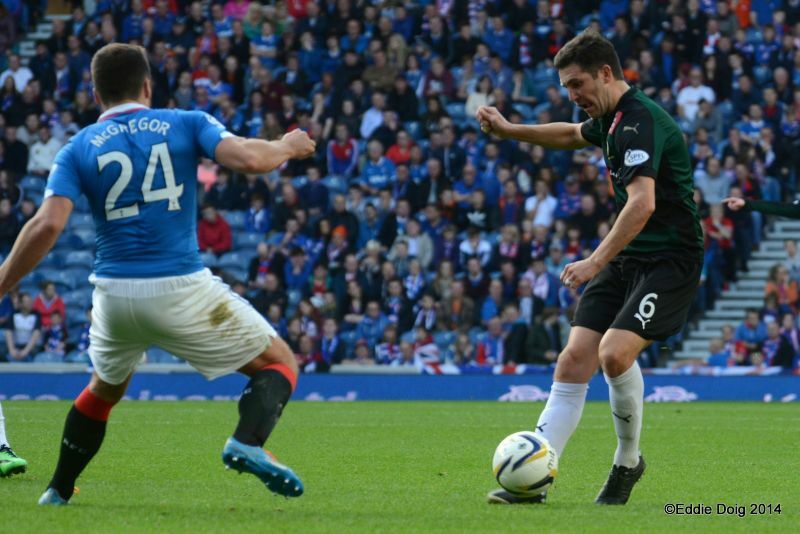 Scott bursts through the Rangers lines and shoots over, the nearside assistant flags for offside. Raith pressing, several attempts at goal being cleared. Anderson crossing from the left, the ball temptingly just in front of the outstretched Stewart who watches the ball go wide. 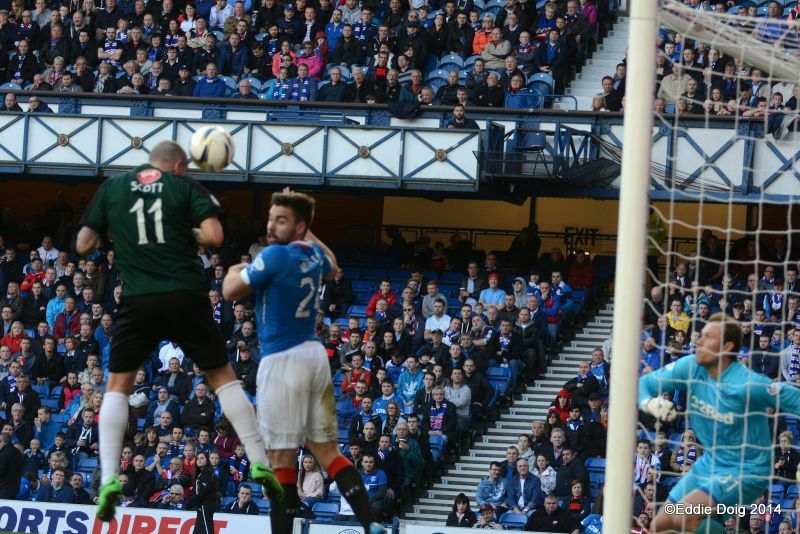 Darren McGregor rises above the pack to head the ball wide of goal. Laurie tried to chip the defence from just outside the box, his effort lands in the arms of Simonsen. Moon yellow for a trip. From conroy's corner Paul Watson heads just past the back post. A quickly taken free kick is threaded through to Law who outwits Laidlaw from 8 yards. Goal Rangers. MacLeod beats his man and shoots past Laidlaw and also tthe back post. Rovers took their eye off the ball for the last goal as they were having a good spell of posession at the time. Watson gets a ticking off for bringing down Wallace. Mr Robertson starts the second half. Grant Anderson cuts in and is denied at Simonsen's near post. Conroy floats a corner to the back post, Thomson rises but heads across goal. Anderson returns to the field. Stewart passes the ball into Moon who's side footed shot falls to Simonsen. Laidlaw bravely dives at the feet of Miller to clear. Anderson the provider, crossed to Scott who rose unchallenged to head past Simonsen. GOAL ROVERS. No sooner had the ball been respotted, Miller finds himself with just Laidlaw to beat and slots the ball home. Goal Rangers. Boyd fires the ball into the box, Miller connects but Laidlaw dives in to clear. Miller again denied by the braveness of Laidlaw. 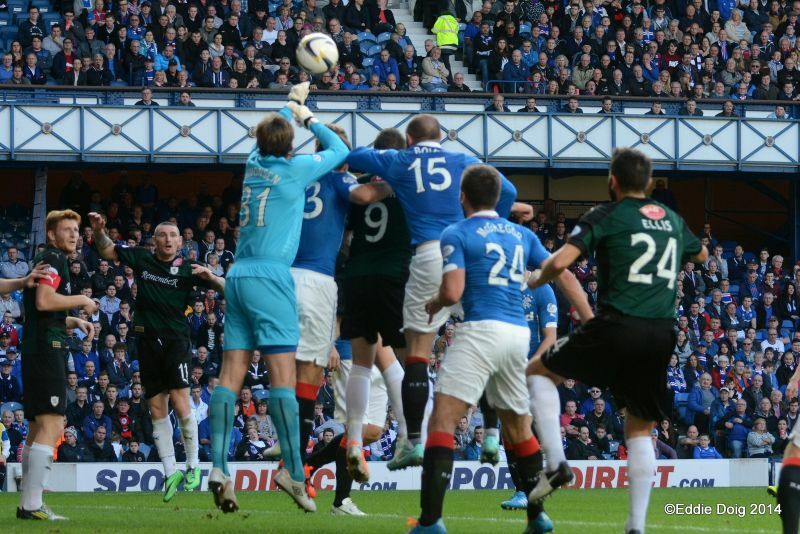 Rovers midfield steal the ball from Rangers, however the final ball fron Anderson flies into the crowd. Boyd turns his man at the D and shoots, Laidlaw gets a glove to the ball but it goes into the net. Goal Rangers. 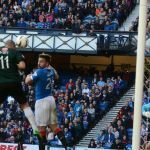 McKeown misshits a clearance, the ball lands to Boyd but his low shot is easily saved. Conroy takes a free kick and unleashes the ball over the wall and the bar. Boyd and Miller off, Clark and Daly on. Scott trying to get past McGregor who is proving to be an able replacement for Moshni in defence. Aird shoots, Laidlaw parries into his path, his second attempt going wide. 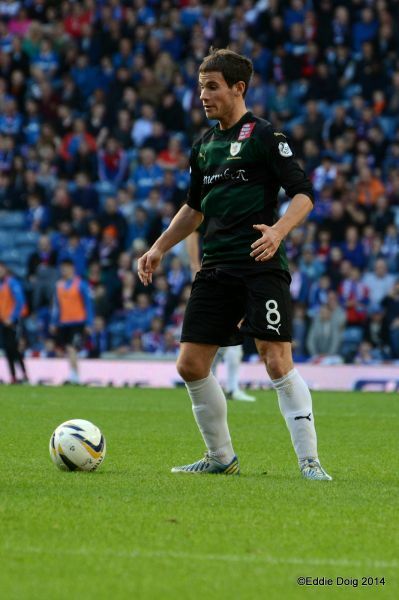 MacLeod off, Templeton on. Fox off, Callachan on. Daly intercepted on the ball by Ellis, there are shouts for a penalty but the ref waves on play. 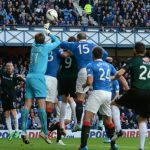 Templeton dinks the ball over Laidlaw who gets a glove to the ball and has to rescue the effort from going in the net. McCulloch at the edge of the six yard box heads the ball towards the corner flag. Foster yellow for bringing down Anderson. Conroy with a retaken free kick, shoots just past the back stick. 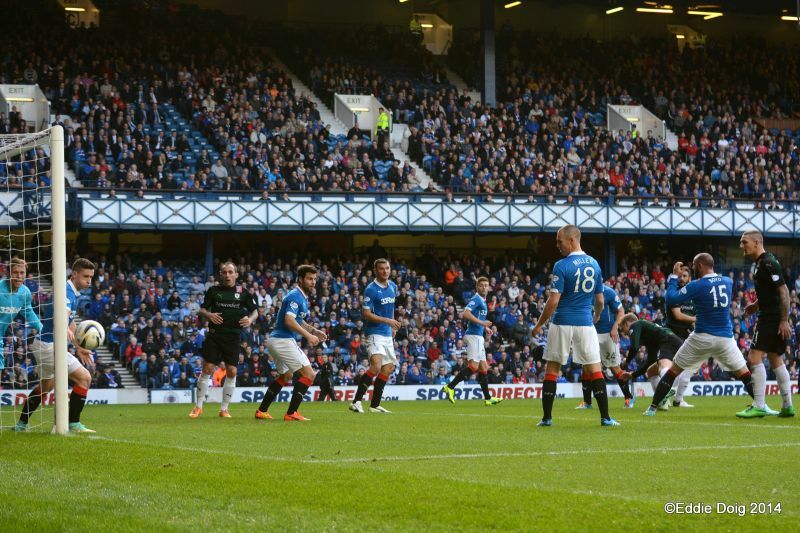 Foster with the cross, Clark dummies and Daly shoots past Laidlaw. Goal Rangers. Laurie limps off to be replaced by Perry. Aird has a pop from 18 yards, the ball nearly making it to the top deck of the Copeland Stand. Lewis drives the ball from 20 yards, Simonsen holds. 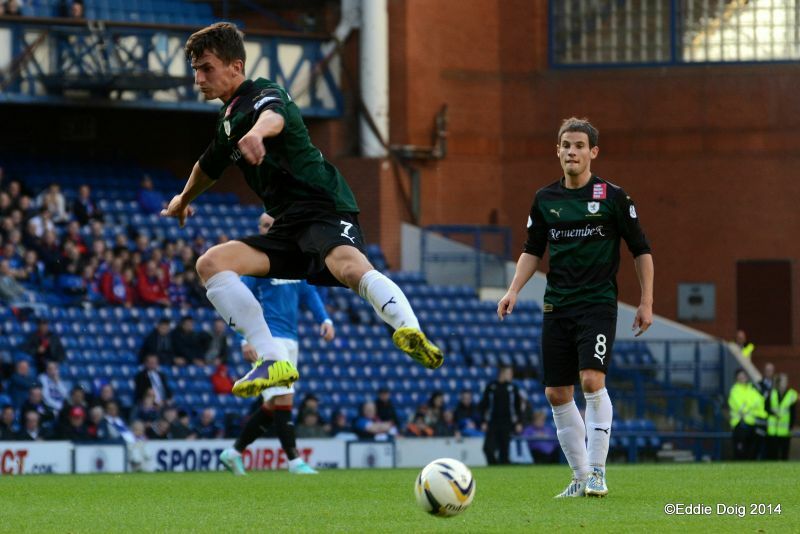 Slack play at the back sees Daly slam the ball into the net. Goal Rangers. Simonsen, Foster, McGregor, Wallace, McCulloch, Law, Black, Boyd, MacLeod, Miller, Aird. Subs: Robinson, Clark, Templeton, Daly, Faure, Smith, Shiels. Laidlaw, THomson, Watson, Fox, Anderson, Moon, Stewart, Scott, Conroy, McKeown, Ellis. Subs: McGurn, Perry, Hill, Callachan, Vaughan, Robertson, Matthews.